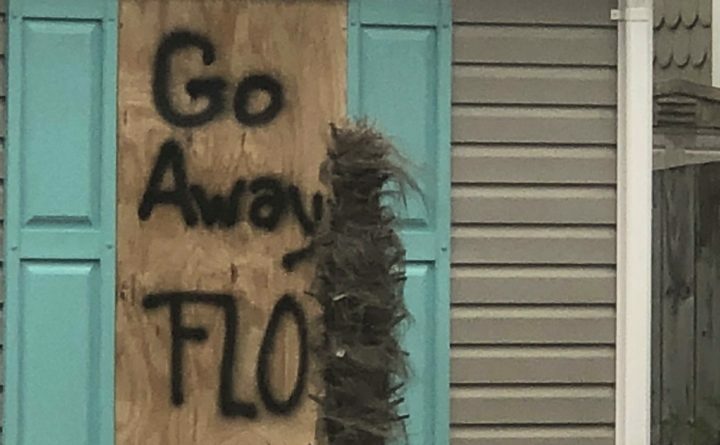 Patrick Vail, of New Bern, North Carolina, who has many family members in Houlton, Maine, shared a photo on Thursday of one of the wooden boards protecting his home that reads "Go Away Flo." Vail is one of many former Aroostook County residents who will ride out Hurricane Florence, a Category 2 storm that is expected to bring heavy rain and winds to much of that state through the weekend. PRESQUE ISLE, Maine — Former Aroostook County residents now living in the path of Hurricane Florence in North Carolina have been busy making preparations and getting ready to ride out the Category 2 storm that already was producing heavy rain and winds on Thursday. Patrick Vail of New Bern, North Carolina, lived in Houlton briefly as an infant before his father, a former Marine Corps master sergeant, was transferred to a North Carolina base in the late 1970s. Since then Vail estimates that he has been through nearly a dozen hurricanes, remaining in his home during them all despite living near the coast. The Bangor Daily News is pleased to feature content from our sister website, The County. To read the rest of “County natives brace themselves for impact of Hurricane Florence in North Carolina,” an article by The County staff writer Melissa Lizotte, please follow this link to The County online.